In a Congress distinguished by its capacity for gridlock, the vote on a bill to help people with disabilities to save for their future was noteworthy, if not shocking. The Achieving a Better Life Experience (ABLE) Act passed the Senate on Dec. 17 as part of a bigger tax package by the margin of 76 to 16. Earlier this month, the bill overwhelmingly passed the often-fractious House of Representatives, 404-17. The ABLE Act helps the families of people with disabilities save for health care costs, housing, lifelong education, and other needs. Under current law, a child diagnosed with a disability can’t have assets worth more than $2,000 or earn more than $680 per month without forfeiting eligibility for government programs like Medicaid. The ABLE Act would allow a tax-free savings account up to $100,000 to pay for disability-related expenses. The aim of the ABLE Act is to remove bureaucratic obstacles to help Americans save their own money to help pay for long-term care. To some activists, it could provide a template for reforming Medicare and Social Security in the next Congress. The legislation follows on the historic Workforce Investment and Opportunities Act, which also passed recently and was already signed into law. Sources: RespectAbility, Christian Science Monitor. ‘Tis the season to save $50 on APSE 2015 conference registration. If you aren’t a natural connector, you’re probably dreading the coming deluge of holiday events and parties. Alaina G. Levine, author of Networking for Nerds, http://www.alainalevine.com challenges readers to make this the year you step out of your comfort zone by filling holiday events with more than just stale cookies and conversation. ’Tis the season to be wise and strategic. If the thought of networking makes you want to spend the holidays with the Grinch in his cave, make it your goal to reach out to just 10 to 15 people with whom you would like to build a partnership in some way. Introduce yourself, wish them a happy holiday season, and ask for an informal discussion to be arranged after the New Year. Let them know why you want to meet with them. That’s all you have to do! ’Tis the season to partake of eggnog — to a point. Yes, there’s a reason why alcohol has a reputation as a “social lubricant.” It can help take the edge off your nerves. Just watch your intake — limit yourself to one small drink. Remember your purpose. You are there to network, not to get drunk. ’Tis the season to get to the point. At a party, especially if it’s a professional event, you don’t need an opening line. Just walk up to someone and introduce yourself. The more you do this, the easier it gets. ’Tis the season to be open. Be open to networking with people who are not in your industry or who seemingly don’t have anything in common with you. You never know what you are going to learn until you engage someone in conversation. ’Tis the season to be bold and courageous. Hidden, game-changing career opportunities are everywhere, but they won’t magically reveal themselves — the only way to access these clandestine gems is via networking. Most people don’t have the guts to pursue opportunities, which gives you a distinct advantage if you do. The bottom line is, networking during the holidays gives you the perfect opportunity to craft new mutually beneficial partnerships and add more fuel to those you have already established. So even if it’s not your cup of eggnog, leave your comfortable corner behind and circulate through the decked halls. You’ll be glad you did come 2015! If you aren’t a natural connector, you’re probably dreading the coming deluge of holiday events and parties. Sure, you know you should take advantage of the opportunity to network at these gatherings (especially if they’re work-related), but small talk and introductions just aren’t your forte. You’re much more comfortable nursing a glass of punch in the corner and limiting your conversations to people you already know. If this sounds familiar, Alaina G. Levine, author of Networking for Nerds, http://www.alainalevine.com challenges readers to make this the year you step out of your comfort zone by filling holiday events with more than just stale cookies and conversation. ‘Tis the season for giving. Don’t think of networking as schmoozing or something slightly sleazy (like selling a used car). Networking is about crafting win-win partnerships that bring value to both parties. Approach networking with the fundamental idea that you are seeking to find out what people need or what problems they have that you can help them with. ‘ Tis the season to be joyful. Networking should be an enjoyable experience, not a treacherous chore that you’d rather delegate to a bunch of elves. Take pleasure in the gift of meeting new people and seeing what can come from the experience. ‘ Tis the season to be jolly. When you are networking and you meet someone for the first time, discuss only positive topics and steer clear of potentially controversial topics like politics and religion. ’Tis the season to reach out. Send holiday cards to clients, colleagues, partners, and people you have networked with in the past year. The cards are a way to keep the connections going, share updates about your career, and most importantly, demonstrate that you are genuinely interested in the recipients’ well-being. Don’t send religion-specific cards. Keep it simple with cards that say ‘Happy Holidays’ or ‘I hope you have a great holiday season’ and don’t reference any particular religion. For new clients or colleagues, include a business card. ’Tis the season to be sociable. 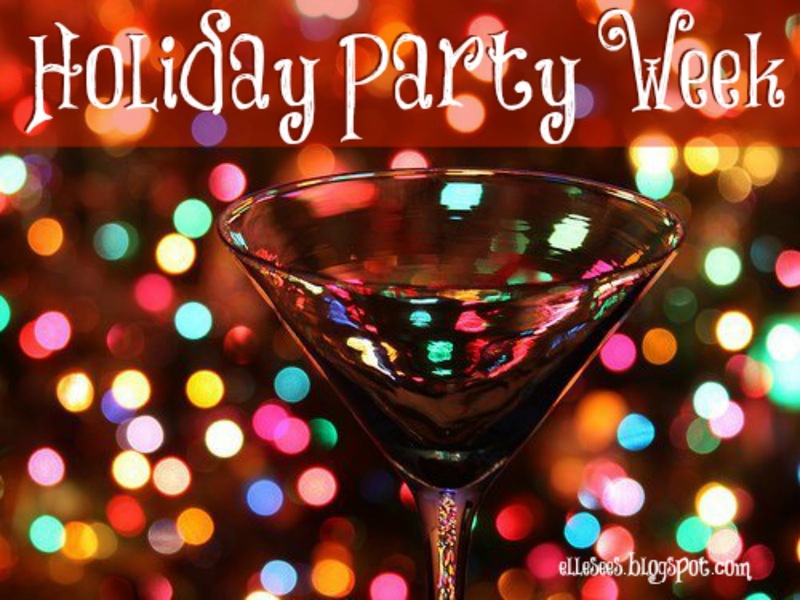 Don’t hesitate to attend optional holiday parties in your area — you never know who you’ll meet. And remember to bring business cards with you to every affair. In particular, be on the lookout for holiday get-togethers hosted by an alumni association or regional chapter, and the charities or other organizations for which you volunteer. 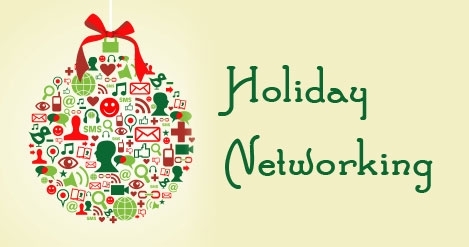 WEDNESDAY: Alaina Levine presents more tips on improving networking opportunities during the holiday season. 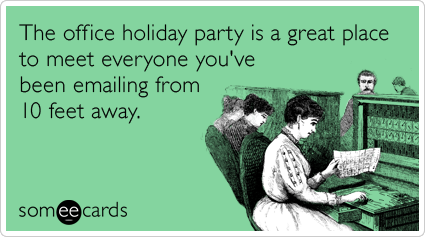 It’s time for the annual office holiday party. 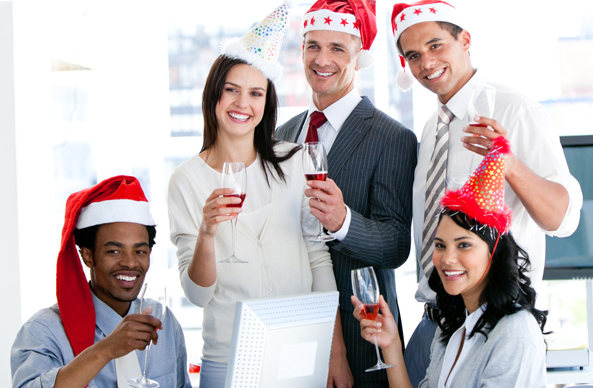 No matter how festive the occasion however, it’s important to remember that a holiday party is an extension of the work environment. While it’s okay to relax and have fun, a professional demeanor is still important because your behavior reflects on you as an employee or as a leader. – Make an appearance. When you make an effort to attend the office holiday party, even for just a half hour, you show interest in and support for your colleagues, organization and supervisor. If you are unable to attend, let the host or someone in charge know that you have another obligation and will not be attending. Simply not showing up shows a lack of respect. – Practice remembering names. The sweetest sound to someone’s ear is his or her own name. When you meet someone new, repeat his name immediately after hearing it. Use the name a couple of times in conversation. If you can’t remember someone’s name, say something like, “It’s been one of those days. I know you’re Paul’s wife, but please tell me your name again.” Or, extend your hand and say your name. This will prompt the other person to say her name too. – Don’t make a beeline for the food and drink. 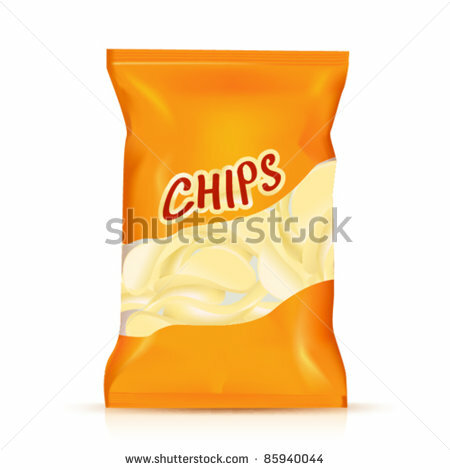 It’s best to eat a little something before the event so you don’t come to the party hungry. Scope out the crowd first and the goodies second. Stay away from messy or difficult-to-eat foods (anything in a red sauce or on a bone) or large hors d’oeuvres that can’t be eaten in one bite. – Hold your glass in your left hand. Always keep your right hand free for handshaking. No one likes to shake a cold, wet hand. Avoid juggling your food and drink and don’t talk with your mouth full of food. Ladies, leave your large handbag at home. It only gets in the way. Carry a wristlet instead. NOTE: Additional tips will be presented later this week. Today is “Giving Tuesday”, a great time to remember the good that we can do this holiday season. If you’re anything like me, your wallet never has enough money to give to all the charitable causes that need your help. But have you thought about donating your time? Members of a local Lions club are assisting the Salvation Army by ringing bells for 2-hour shifts, at various stores in Waupaca, Wis., on Saturday, December 13. 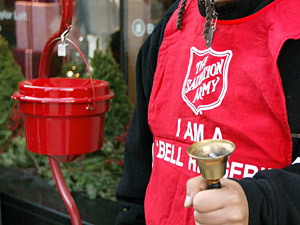 I say that not to toot our own horn (or, ring our own bell, as it were), but to point out that a nonprofit you belong to might be interested in helping out the Salvation Army by ringing bells in your community. It’s even funner if you can do so as a group, like we are doing. Something to think about. The Employee Assistance Professionals Association (EAPA) has become aware that some members have been contacted by a mailing list company purporting to be selling the attendee list from the 2014 World EAP Conference. EAPA has been able to determine that this list is fake, and while we have no way of knowing whether any actual conference attendees have been placed on the list, it is NOT the conference attendee list and EAPA has no connection with the soliciting individual or group. Sadly, frauds like this one are becoming more commonplace. Another example EAPA and other associations have dealt with recently are the “room pirate” groups that contact prospective attendees or exhibitors at conferences purporting to have access to discounted rooms at conference hotels. EAPA recommends that all members, exhibitors, and EA professionals remain alert for these scams, and let us know if you receive suspicious communications.